I'm so excited to show you my latest creation. Recently (I know I'm late to the party!) I've gotten hooked on YouTube videos for learning almost everything new. My daughter got me started when she learned how to sew solely from YouTube instructional videos. 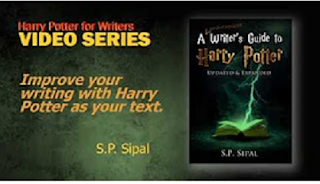 So, I started thinking, with the new edition of A Writer's Guide to Harry Potter being out, maybe I could try to put together some of my own how-to videos based on the book and my favorite posts from this blog. I didn't realize how much work it is! But it's been fun learning. Now that I have the basics covered, I want to share the three I've done so far with you. And what better day than September 1, as well all head back to Hogwarts in our hearts! I hope these videos will help you peer beneath the surface to how J.K. Rowling created all that magic. I'll keep adding to the playlist, but would love any comments as to what topics you'd love to see covered in these videos. And here are the three videos embedded here. As my channel and videos are brand new, I'd love it if you could take the time to like and comment on the videos and follow my channel.